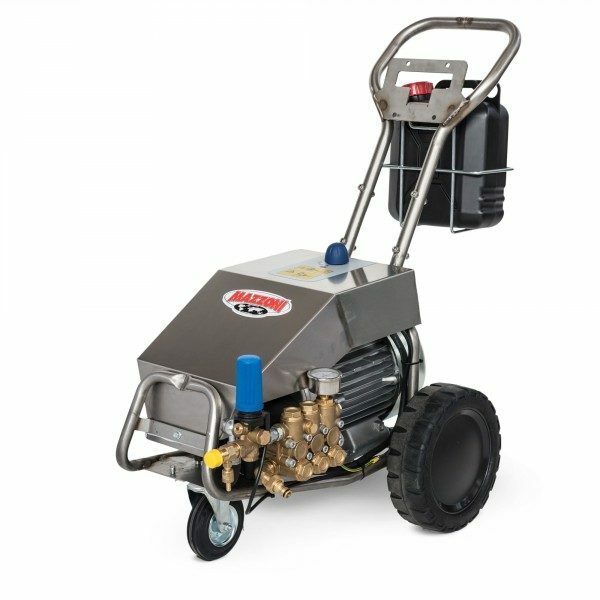 Cold water high pressure washers complete in stainless steel fixed on two pneumatic wheels and one rotating wheel. MEC series electric induction motor, S1 continuous duty with thermal protection integrated on the windings. Motor with high efficiency, with high performance and low consumption. Elastic coupling. Professional pump Mazzoni in line (with connecting rods), brass head and three ceramic pistons. Stanless steel lance with automatic spray gun and quick coupling for accessories. Ideal for cleaning encrusted dirt , with it’s pressure and flow rate. KX pressure washers allow the washing of large areas with a low power consumption. The stainless steel frame which features versions KX, makes this machine suitable for work environments that require a strong and impact resistance. A lightweight design and the third front wheel ensures ease of use, manageability. Recommended use: Construction, food industry, shopping centers, supermarkets and fishmongers etc.